Sony has always been an international leader in consumer electronics, and it has rightfully earned its position among the top manufacturers of HDTVs. While Sony has a reputation as a high-end brand, its lineup of HDTV models includes some budget units as well. Sony is a brand that can clearly be relied upon, and it offers enough of a selection of models to satisfy most HDTV purchasers. Searching for a specific Sony TV review? Sony needs no introduction. It has always been at the forefront of innovation when it comes to consumer electronics for entertainment purposes, and any product it manufactures quickly establishes itself as a leader in its class. An HDTV from Sony is always a reliable choice, and even though newer brands may be able to offer lower-priced alternatives, Sony’s legendary reliability means that choosing a Sony HDTV is a value investment rather than an inexpensive purchase. Sony products are backed by international service warranties that are praised by consumer affairs experts, as Sony maintains its brand reputation through excellent customer service as well as by original design and careful manufacturing processes. 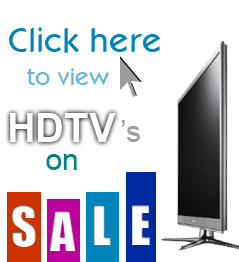 Sony HDTVs are at the peak of the category as far as quality is concerned. From the attention paid to the very finish of the TV frame and the comfort of use of the remote and fixed control buttons to the outstanding picture quality of even lower-priced Sony models, every detail of a Sony HDTV speaks quality. Sony products are meant to last, and most users report only the highest level of satisfaction with their Sony HDTV units. It would not be fair to say that Sony is a price leader, as that is not how Sony positions itself or even wishes to be seen. However, thanks to their arrangements with major retailers and their commitment to producing HDTVs of different price levels, practically any consumer who is considering purchasing an HDTV will be able to find an affordable model from Sony. The only question is whether another manufacturer can offer more features for the same price as a more basic Sony, and in that case it is up to each consumer to decide whether Sony reliability is worth more than the added features that other HDTV brands offer in the same price range. When it comes to high-end HDTVs, however, Sony is the clear choice, as its quality is often the same, if not even higher, than that of top specialty brands. Sony is there for consumers who purchase any of its products, and its legendary level of customer service especially applies to big-ticket items like HDTVs. In the rare event of a defect or other issue covered by the manufacturer’s warranty, Sony will do everything it can to expedite service, from arranging for pickup if necessary to replacing, rather than repairing, an HDTV that somehow fails soon after it is purchased. Sony will do its best to make sure its customers are satisfied, and even if a repair becomes necessary for reasons not covered by the warranty, Sony will assist customers as much as possible in arranging for repair of their HDTVs. However, the quality of a Sony HDTV, and the quality control process that its factories strictly adhere to during the manufacture of HDTVs, mean that repairs are almost never necessary during the normal service life of an HDTV. Sony is and always has been a top name as far as reliability, integrity and, most of all, quality, are concerned. A Sony HDTV may not be the least expensive alternative, but Sony does have a range of affordable HDTV models. However, a Sony HDTV is a leader as far as real value is concerned, because it will provide years of reliable and enjoyable service with no need for repairs or maintenance. Sony should be a first choice for any HDTV consumer, and other options should be compared on the basis of price and available features, as there is practically no brand of consumer electronics that surpasses Sony when it comes to quality or customer satisfaction. A Sony LCD or plasma HDTV is always a top choice, and even lower-priced Sony HDTV models are made with the utmost care and attention to quality that has made Sony famous for generations. I bought a 52 Sony LCD Bravia HDTV 2 years ago and it started getting 6-8 inch vertical lines in the picture. I called the repairman that Sony recommended since it was out of warranty and he came out and looked at the tv and said u might as well buy another tv because this happens all the time and it cost more to fix it than a new TV but I will email u an estimate. He also said maybe I can get Sony to replace the part for free cause this happens all the time. He did email an estimate and it wasn’t free it. It was $4089.56 needless to say I wont be fixing the tv and won’t ever buy another Sony. If your thinking about buying a Sony think again. I’m surprised you had such a serious issue with your Sony. I’ve owned several Sony TVs (as well as other Sony products) and haven’t had any problems with any of them. So this review seems pretty accurate to me (with the exception of their customer service, I can’t speak to that since I’ve never dealt with them). In fact, I just bought a new Bravia a little while back when I switched the rest of my equipment to HD. I had a 720p set, but it just wasn’t up to taking advantage of all the high definition channels I’ve been getting since I upgraded to the HD Free for Life promotion though my employer, Dish. My new 1080p Sony Bravia looks gorgeous, especially when watching sports in HD, like when I have everyone over for UFC events. Let me start review lines, Those who are reluctunant to change, Vanishes. And, Change is Inevitable. SONY seems to be forgetting these things. SONY is no longer the same name that it used to be in CRT. If anyone needs to experience torture, hell then you go for SONY Tv’s. I bought Sony Bravia, and its LCD failed. There executives accepted the product failure but didnt helped me in any way. I followed up with highest SONY management, it was in vain. SONY s senior most people are simply beurocratic. When shared with the other friends, they asked me why I went for SONY TV at first place, SONY is making losses since last few years…SONY is no the same name that used to be, most of the people dont know reality, SONY was planning to close its TV business. Check on net more and you will get shocking details.